Check out the 3 minute video on Super Moons at this NASA site. September’s SUPER Full Moon orbits closest to the Earth (perigree) and is BIG and Bright and is the last Super Moon of this year. Its energies pull on the tides and on our emotions. This is especially true as Chiron, next to this Piscean Moon, heightens our emotional sensitivities. Chiron is a minor planetary body, discovered in 1977. It orbits between the material world (Saturn) and the Metaphysical world (Uranus). Chiron, the “wounded healer,” enables us to experience our wounding and facilitate our healing. Chiron” is a link between body and spirit. Today’s Full Moon energies can enhance our spiritual and emotional receptivity. It’s important to be protective, and treat ourselves with compassion. If memories come up around old wounds – let them flow and release them. For some, this cycle can feel very intense and upsetting. Astrologer, Emily Trinkaus advises us to “unplug from the energy of collective trauma and reconnect with the ultimate level of reality, where everything truly is in Divine Order (despite apparent evidence to the contrary).” It’s a time for healing and for tuning into that energy that connects with our higher aspirations. Saturn will be in harmony with the Full Moon and Chiron, adding its strength and grounding to our enhanced sensitivities. Saturn’s influence can stabilize us. I encourage everyone to turn off any news of violence and mayhem – on computers, tv’s, etc. during this Full Moon (and whenever possible). We have a powerful and rare opportunity to “catch up with ourselves”. Let’s use this time to reflect on our higher values – and “infill” with calm. This positive energy will ripple out and contribute peacefulness into our environment. I’ve been enjoying this calendar for over 20 years. It’s easy to use, beautiful and very helpful. 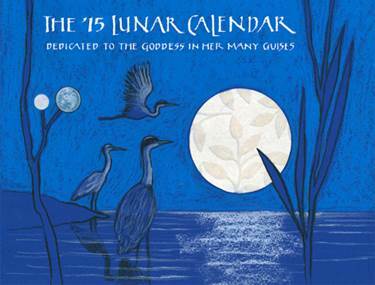 You can order your 2015 Moon calendar now. https://www.thelunapress.com. Understanding our birth charts helps clarify the nature of our struggles and the nature of our gifts . What are our strengths and where do we get stuck? What are the timings for each planetary cycle and how are we affected? Deeper self-knowledge is vital for developing acceptance and compassion for ourselves and others. Astrology helps us remember that the challenges we face are cyclical. Our birth charts highlight opportunities where we can learn and grow. Astrology readings are done in person or by phone. They take about an hour and a half and are digitally recorded. You’ll receive your hand-drawn chart, and the recorded cd(s) of your reading. For out-of-town clients, the reading package is mailed. Payments can be made using PayPal.